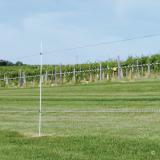 This low-cost and easy to maintain 3D anti-deer fence has a proven record protecting apple orchards, tree farms, vineyards and stands of newly planted trees from deer. It’s two vertical fences of electrified rope set 3 ft apart. They combine to make a barrier that has both depth and height. 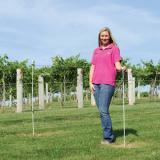 The rope is supported by FiberRods™ and /or insulated wood or steel posts. An energizer is connected to the rope to provide the essential pulses that instill fear in deer. Scent caps are attached to the rope at intervals to induce deer to touch the rope with their noses. As low as 44¢ per ft.
Why does a 3D fence work? Experts tell us that deer have “landing anxiety” before they decide to jump over something. So, when facing a fence that has height, length and depth (thus 3D) deer are more tentative than with a fence that’s only “2D” (tall/wide but not deep). Why? It seems that the depth perception of species with side-of-the-head eye placement (deer, horses) is less than for species with both eyes in front (cattle, humans). That is why deer are tentative when they see a 3D fence and are likely to stop...slowly walk up to the fence...check the fence with their nose...and receive a strong electric shock. The pain encourages deer to find a less risky “restaurant,” trail or bedding ground. Attach insulators/clips. Insert and tension rope. Attach and bait scent caps. Electrify with a suitable energizer. Perform semiannual maintenance. Expect to tension the rope and reset some of the FiberRod posts. Scent caps should be refilled before a season of high deer activity (and ideally every 10 days during the high-activity seasons). When are those seasons? For rubbing damage it’s in the autumn before the rut. For browsing damage it depends on plant species being browsed. Weed growth under electrified ropes needs to be removed or sprayed once each summer. Increase rope longevity. Allows rope, twine, tape and cable to flow around corners and curves when tension changes occur (due to ice, snow and impacts). For attaching conductors at desired height on 3/8" fiberglass posts. Design allows conductors in but prevents their escape. 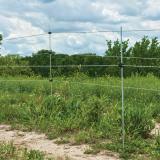 Reliable insulator for wood/steel posts and trees at the ends, corners or curves of semi-permanent and temporary fences. Use this Rope-To-Rope Link to make a rapid connections between 6mm electrified rope lines on permanent fences.